Donruss Playoff announced on Wednesday that it has reached a multi-year autograph and marketing agreement with Patriots quarterback Tom Brady, the Super Bowl XXXVIII MVP and two-time Super Bowl champion. Brady, the youngest player in NFL history to twice be named Super Bowl MVP, will appear on the company's packaging, advertising and point-of-sale initiatives over the next two years. "In Tom Brady, you're talking about one of the greatest young talents in the game today whose championship pedigree is swiftly becoming the stuff of NFL legend," said Donruss Playoff football brand manager Nick Matijevich. "His impeccable performance in the Super Bowl during the last three seasons has thrust him into the national spotlight in the most positive way possible. And he's just as impressive off the field. "In every conceivable way, Brady is someone we want to be associated with; someone we think perfectly embodies what Donruss Playoff football cards are all about - winning, class and excitement." 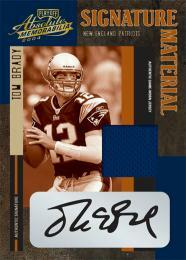 The first Donruss Playoff packaging featuring Brady will be 2004 Playoff Absolute Memorabilia, set to release in August.